Washington, DC, October 1, 2012 – The Armageddon Letters - a transmedia project (multiplatform storytelling) launched on the occasion of the 50th anniversary of the Cuban missile crisis - takes visitors behind the scenes during the October 1962 Cuban missile crisis, the most dangerous crisis in recorded history. The project is based at the Balsillie School of International Affairs and is led by the scholars and filmmakers – long-time partners of the National Security Archive – that were involved in the Academy Award-winning documentary, THE FOG OF WAR, and the Golden Palm Award-winning, VIRTUAL JFK. The Armageddon Letters refers to the unprecedented exchange of letters and other communications between Kennedy, Khrushchev and Castro, before, during and after the crisis. Nuclear Armageddon is possible. As a matter of historical record - not merely hypothetical scenarios or other projections - it is now known that a catastrophic nuclear war nearly happened in October 1962. "The portraits of President Kennedy, my father, Soviet Chairman Nikita Khrushchev, and Cuban leader Fidel Castro are intimate, totally believable and instructive. Based on decades of careful research, this is a work of sober history that reads like a horror novel with an almost miraculously lucky outcome. I could not put it down." – Sergei N. Khrushchev , Senior Fellow Watson Institute for International Studies, Brown University, author of many works on the life and career of his father, the former Soviet chairman Nikita S. Khrushchev, including Nikita Khrushchev and the Creation of a Superpower. 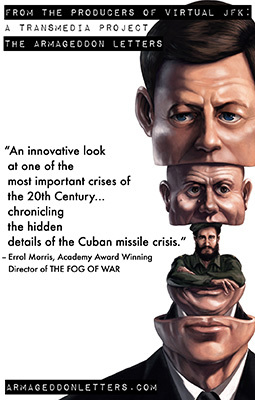 "For over a quarter century Jim Blight and janet Lang have earned the gratitude of scholars and the interested public by highlighting and preserving the human dimension of the Cuban missile crisis, the most dangerous moment of the twentieth century. With The Armageddon Letters , they are now brilliantly connecting the IPad generation to Kennedy, Khrushchev and Castro and to the lessons of that near nuclear catastrophe." – Timothy Naftali , coauthor of "One Hell of a Gamble": Khrushchev, Castro & Kennedy, 1958-1964. – Scott D. Sagan , The Caroline S. G. Munro professor of political science, senior fellow at the Center for International Security and Cooperation and the Freeman Spogli Institute, Stanford University, and co-author (with Kenneth Waltz) of The Spread of Nuclear Weapons: A Debate Renewed. Download an excerpt from the book here.